The Satyajit Ray film is based on a story by Rabindranath Tagore. The film deals with the theme of loneliness in marriage and of forbidden attraction. 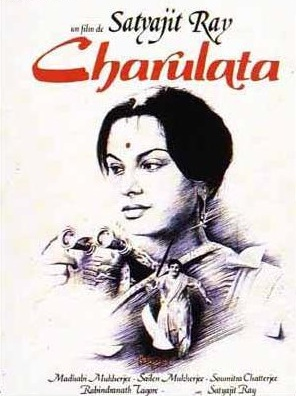 The protagonist Charulata lives in an aristocratic Bengali family and is shown as the neglected wife of a busy editor. She observes the mundane activities of daily life through her binocular, or embroiders a handkerchief in the initial sequences of the film to show a lack of gainful occupation. The film moves very slowly – just like life. Ray is precise in capturing the mood and the times. Rabindrasangeet such as “Ami chini go chini….” sung by popular singer Kishore Kumar has been used aptly. It is basically about a complex and amorous relationship that develops between Charulata and Amal (Soumitra Chatterjee), a young graduate and a wannabe writer, and the younger brother of the husband of Charulata. I think Purnendu Pattreya also made a Bengali film Streer Patro featuring Madhabi Mukherjee also based on a Tagore novella, and if I am not mistaken, that film also harped a similar theme. The weakness of the film, in my view, is the use of symbolic clichés of gathering storm when Amal appears for the first time, or towards the end where a storm rises forcing the husband (Sailen Mukherjee) to return back when he discovers his wife’s cravings for Amal. In retrospect, the film could be viewed as a document of a bygone era, of its women and their lifestyle & the anglicized topics of discussion in vogue (the editor husband celebrates the coming of Liberals beating Tories in a foreign country), but somehow fails to make a bold and conclusive point at the end. Fifty years or so later, in modern Bengali society, would couples still compromise and co-habit as Charulata and her husband do in their Nosto-Neer (Ruined Nest)? Charulata is slated to be shown at the forthcoming Cannes Film Festival in 2013. Interestingly, almost 50 years back, this film was rejected from Cannes in 1965. This film about a lonely wife and her attraction to her brother-in-law went on to bag the Silver Bear at the Berlin International Film Festival in the same year, and the Golden Lotus Award at the National Film Awards.